REGISTRATION opened on March 1st, 2019! All conference attendees must register for the conference from the registration tab. The ABSTRACT submission also opened on March 1st. Abstracts will be accepted until May 31st, 2019 at our submission site. Please note: We require all presenters (both symposium and poster sessions) to submit abstracts so that ISZB-2019 program book is complete. Click on the following link to download the template. Important: Each presenter, except for young investigator awardees, will be allowed to give only one oral or poster presentation, but he/she could be a co-author on more than one abstract. *Young investigators have a chance to be selected for “Young investigators Award” or "Poster Award". Young Investigators Awardees will present their talk in SP4 (Sep.10). Registrants will have an opportunity to reserve their room accommodations at Kyoto Garden Palace, or other hotels in Kyoto via ISZB-2019 homepage. Registrants can book their room AFTER registration for the conference. NOTE: September is the best season for tourists in Kyoto, so please register first and book your room as soon as possible. Excursion is held on Wednesday afternoon, Sep. 11, 2019. We offer a half-day tour visiting the historical world heritages of Byodoin Temple and Ujigami Shrine with English guide. ** Please make sure to complete your registration and payment before making the request. 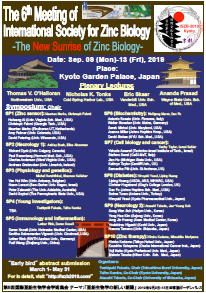 Theme: "The New Sunrise of Zinc Biology"